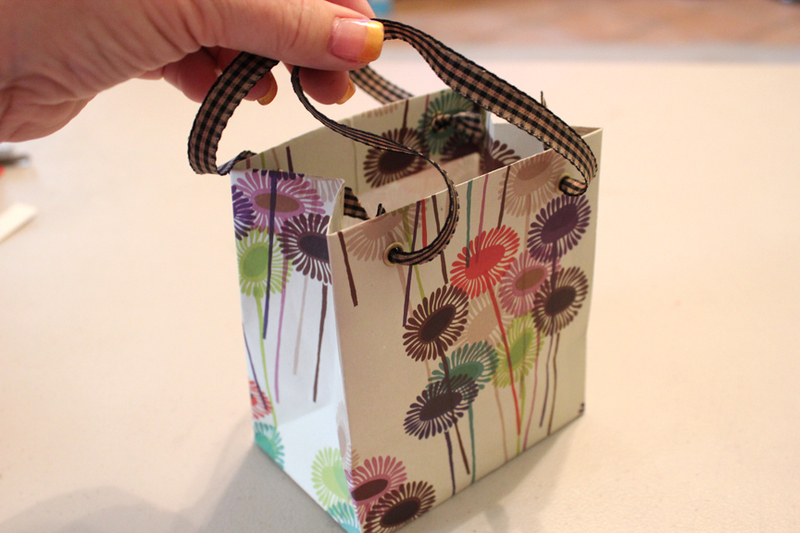 Day 224 – Mini Gift Bags You Can Make! 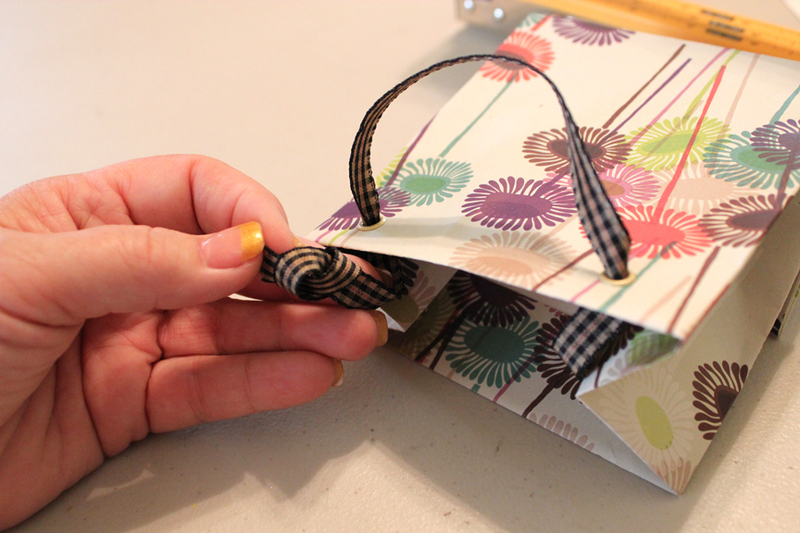 Here are some of the cutest little gift bags that are really easy to make. 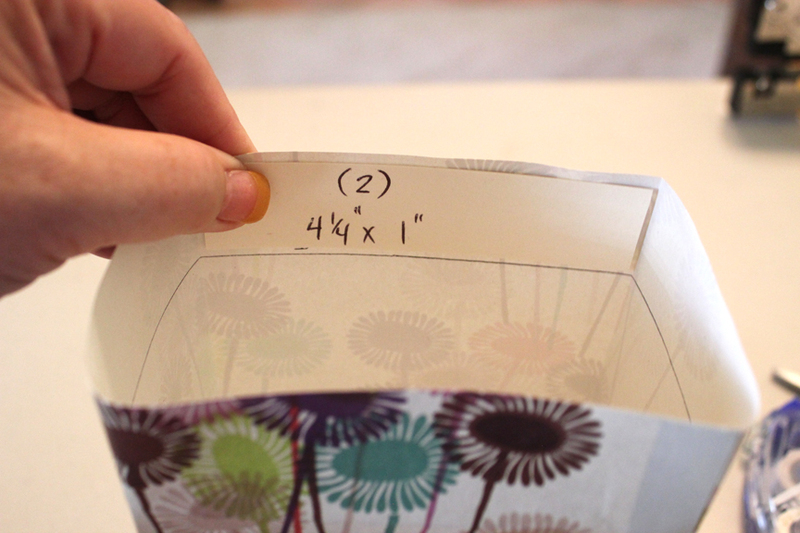 The paper bag is made from your decorative paper cut from a rectangle 15.5 in wide x 8.25 in tall. 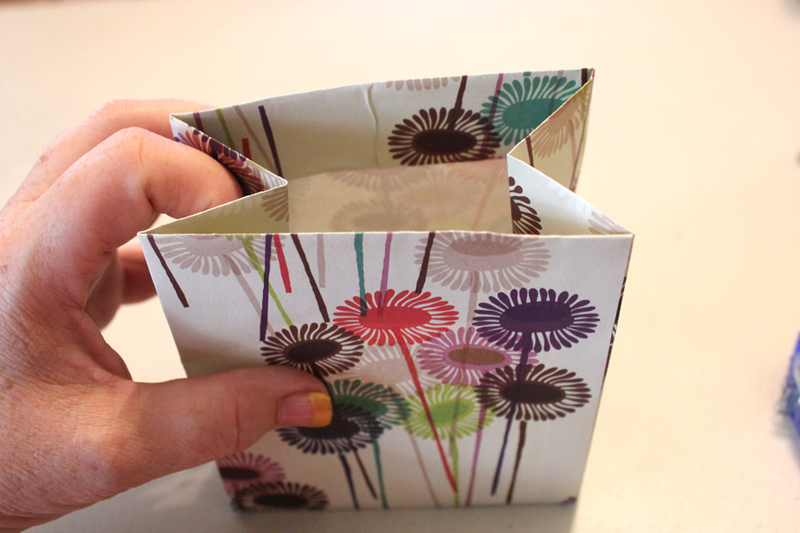 The finished size is 5 inches tall by 4.5 inches wide by 3 inches deep. 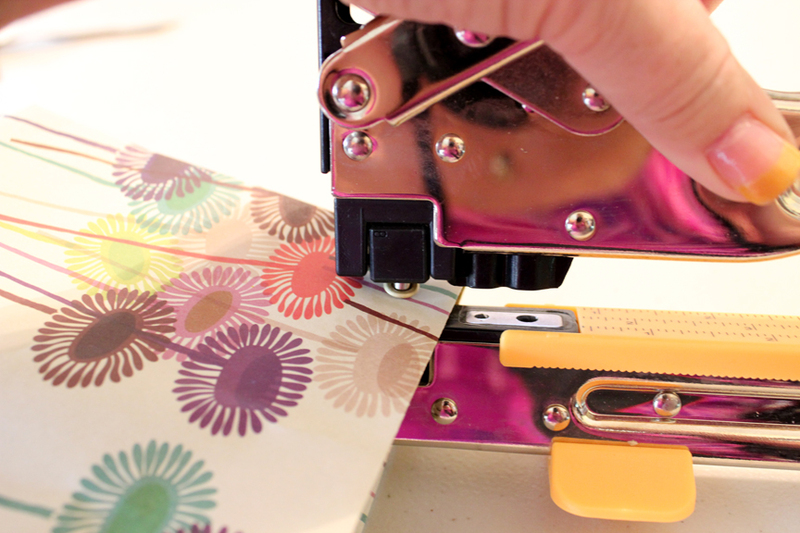 You will need scissors, craft tape(sticky on both sides), decorative paper, thicker cardstock for inside top flap of bag to make it stronger, rivets, rivet punch like the BIG SHOT and ribbons or cording. 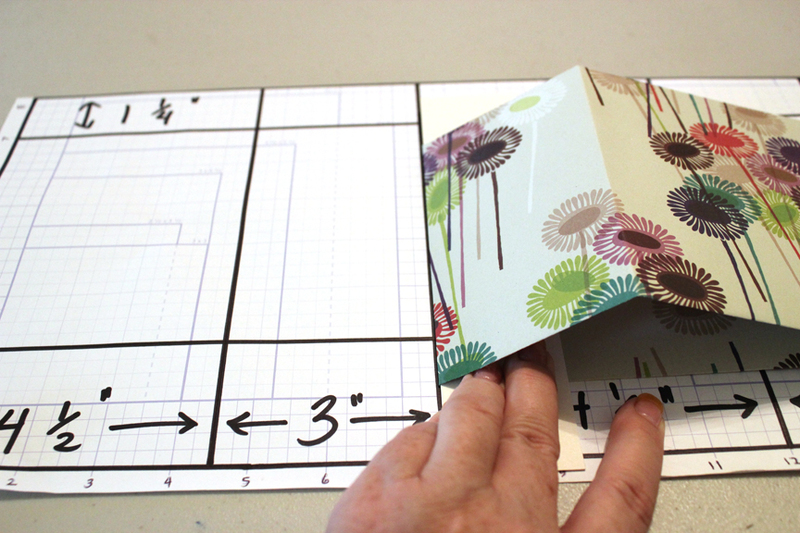 Make pattern: Cut plain paper 15.5 inches wide x 8.25 inches tall. This will be your guide. Make markings as shown in picture. 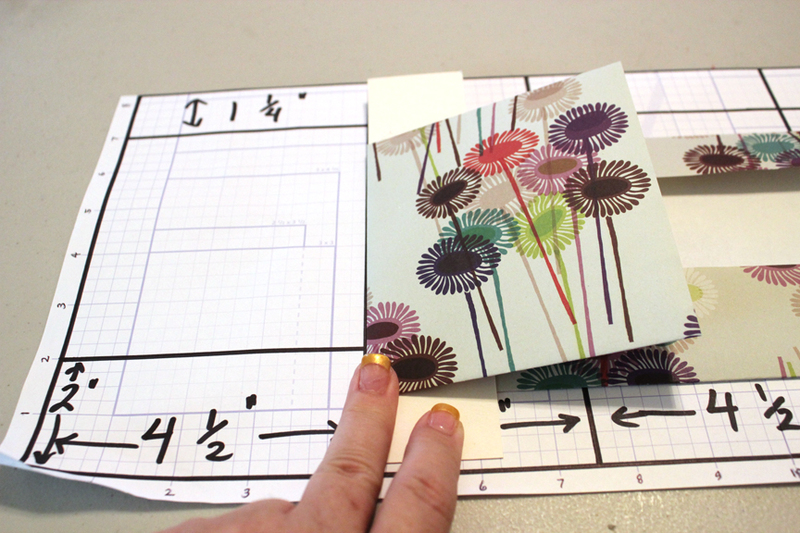 Horizontal lines….1.25 inches from top, 2 inches from bottom. 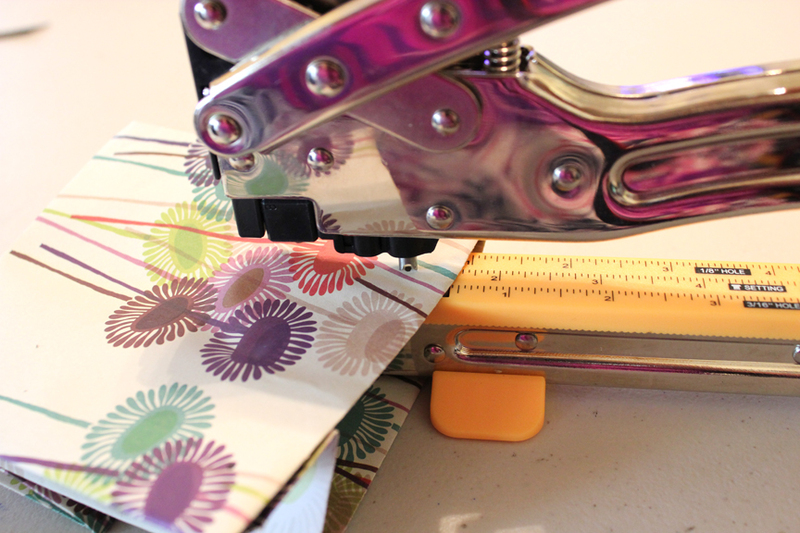 Verticle lines starting from left edge…4.5 inches, 3 inches, 4.5 inches, 3 inches and 1/2 inch from right hand edge. 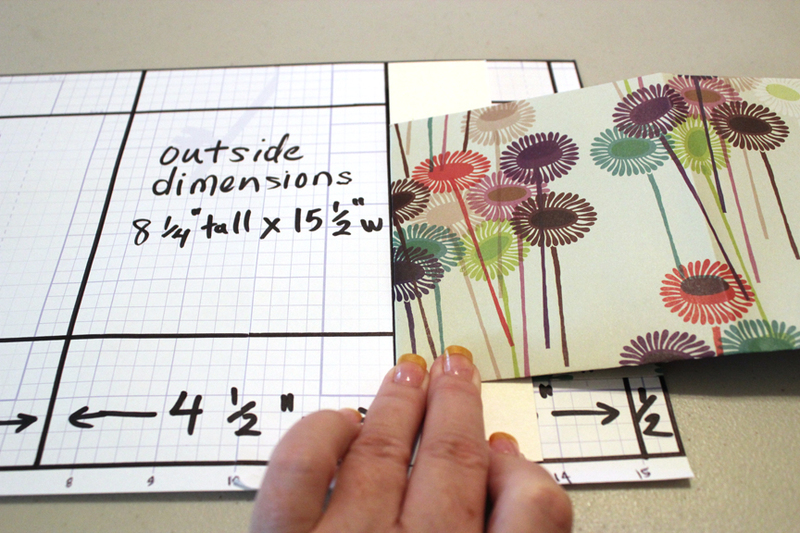 Cut your patterned paper 15.5 inches wide x 8.25 inches tall. 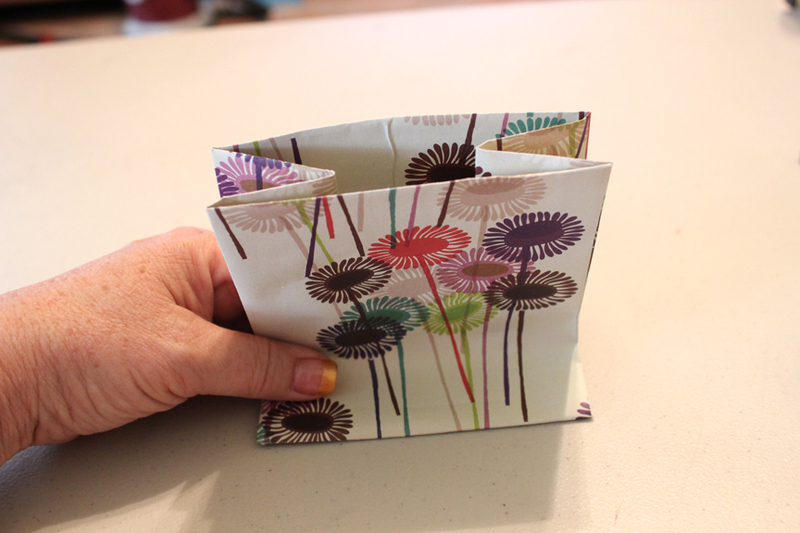 Fold bottom edge up 2 inches and top edge down 1.25 inches. 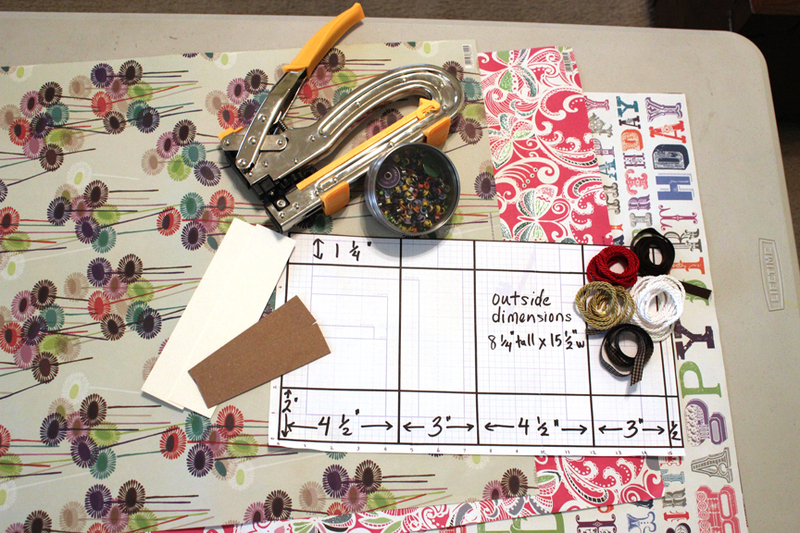 Place on pattern making left and right edges even with pattern. 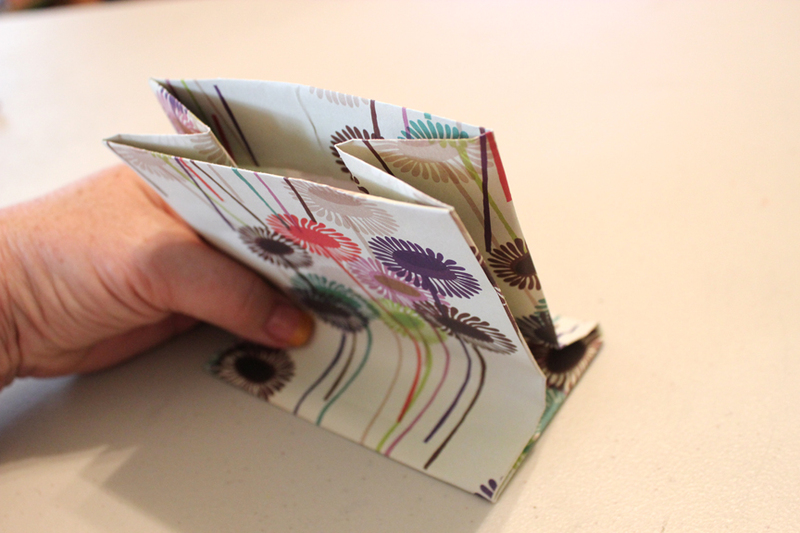 Make your folds at 4.5 inches……. 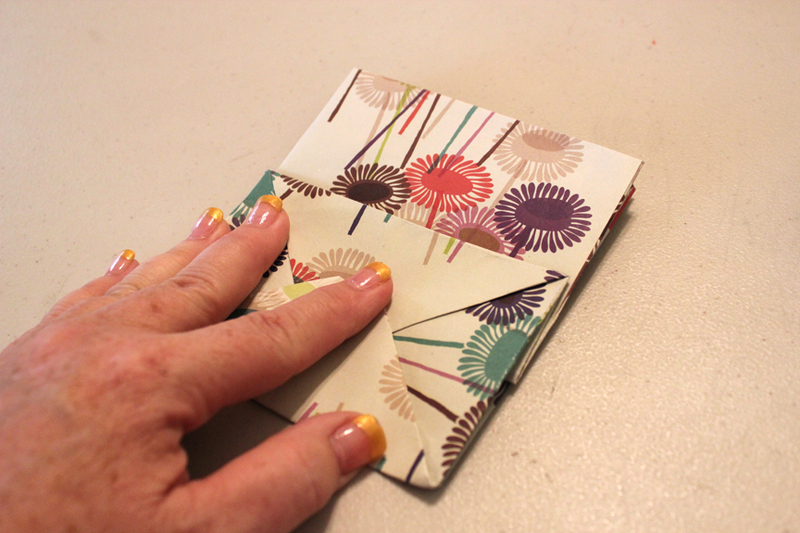 Then another 4.5 inch fold………..
Then fold up the last 1/2 inch. 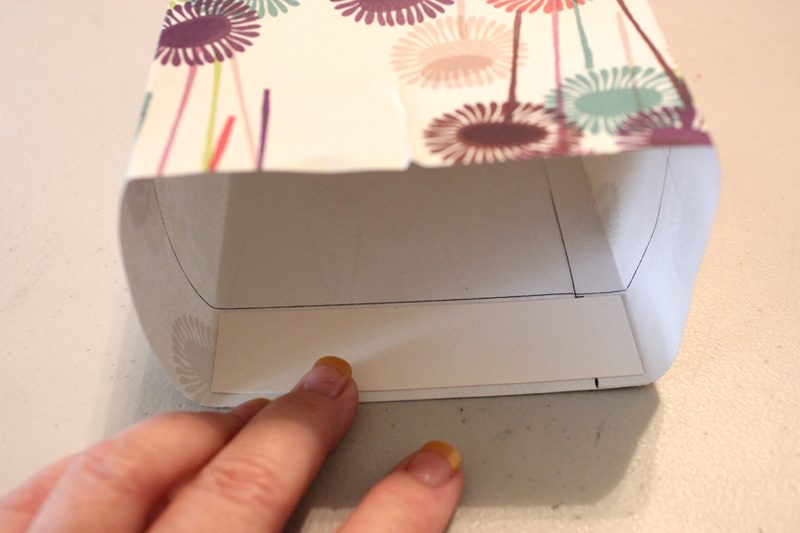 Open up and unfold top and bottom flaps and adhere outside edges with double sticky tape or glue. 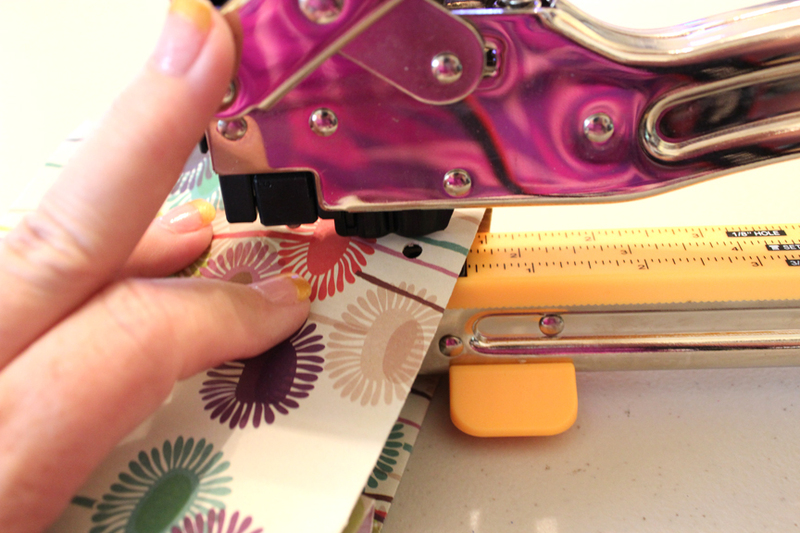 The 4.5 inch end will overlap 1/2 inch and meet at that 1/2 inch fold. Make sure all four edges have a good crease. 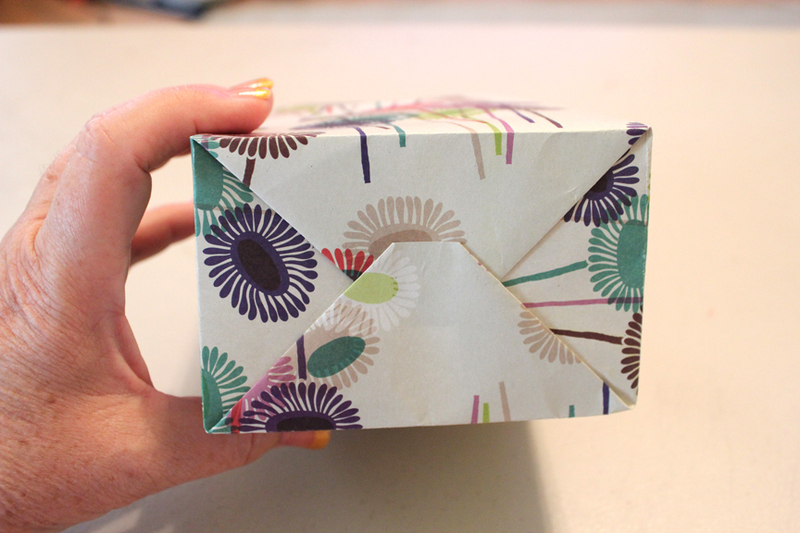 Fold bottom flap like you would do if you were wrapping a package. 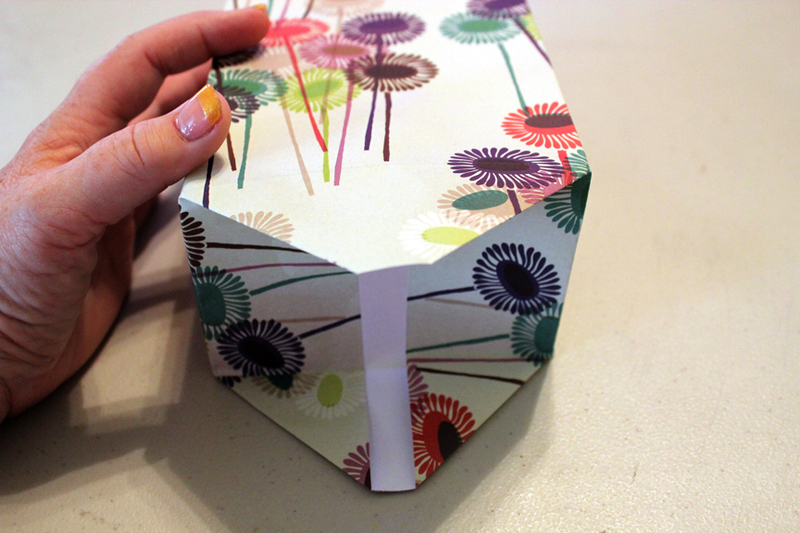 Adhere with double sticky tape or glue. 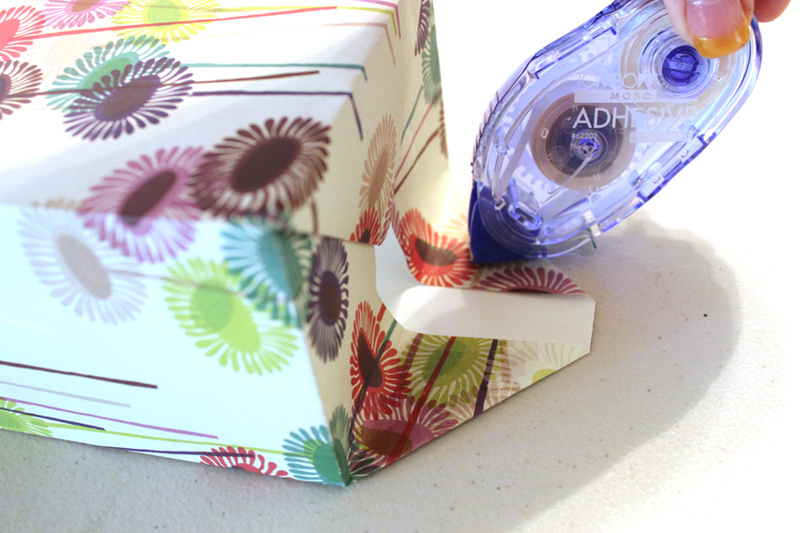 Make sure you don’t put the tape on the white part…or when you fold the bottom up…you will have a sticky section on the inside of your bag. It should look like this when you have it taped down. 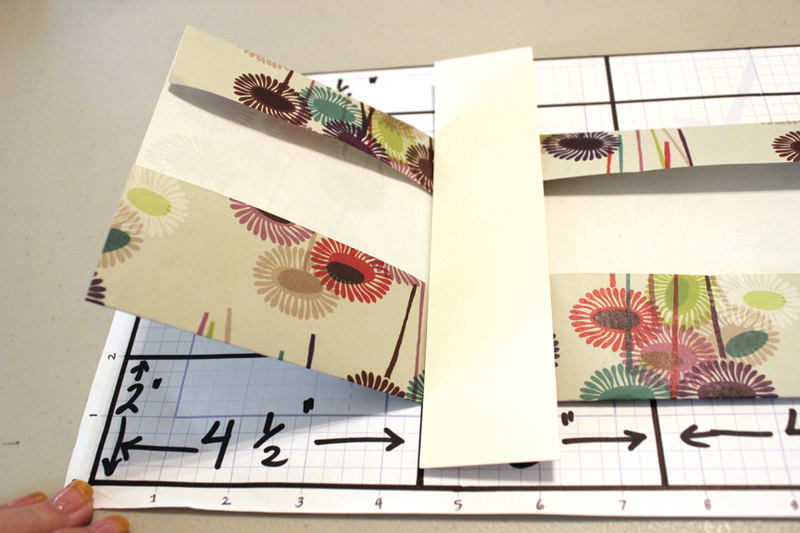 Cut 2 pieces of thicker cardstock(I used the dividers from my box of Lipton tea bags) at 4.25 inches x 1 inch. 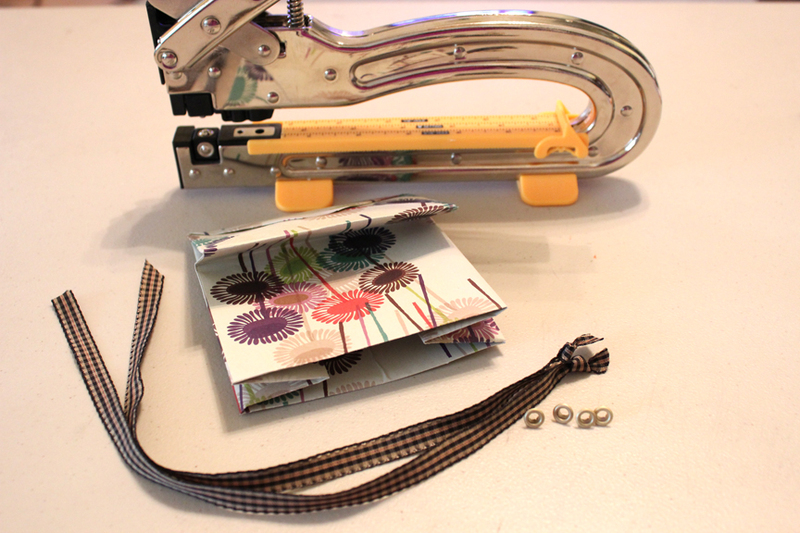 You will adhere these with tape inside so that when you fold down the top edge, you’ll have a stiffer thicker top which will make the bag more sturdy when you add the rivets and ribbon. 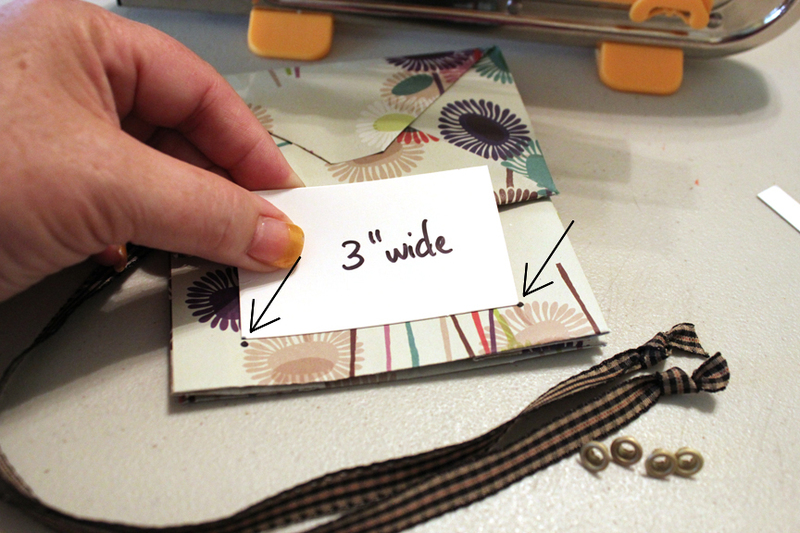 Adhere to the inside of both 4.5 inch front and back with double sticky tape or glue. 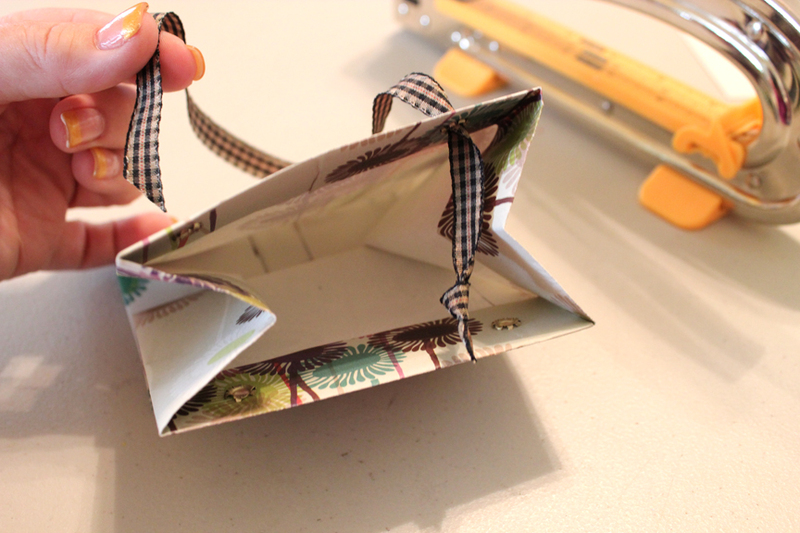 Put double sticky tape on the inside and fold down to create finished top of bag. 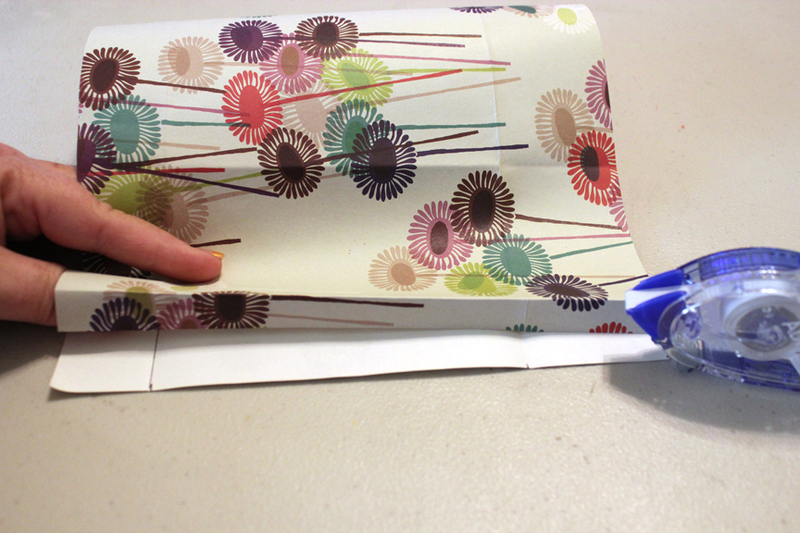 Crease and fold your bag like you would a lunch bag. Now you are ready to put the rivets and the ribbon handles on. I used the BIG SHOT rivet tool and the larger rivets. 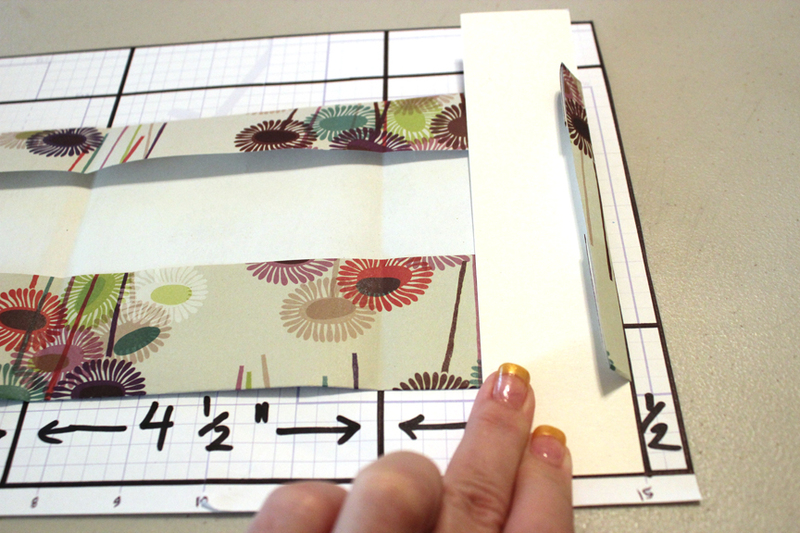 Cut a piece of paper 3 inches wide, or use a ruler and mark where you will put your rivets with a marker or pencil. For the picture below, I cut a paper 3 inches wide and marked on the outside edges on the paper bag with a black marker about 1/2 inch from the top edge(denoted by arrows in the picture below). This is where I will punch the holes for the rivets. Cut 2 ribbons or cording 14 inches long each. Make a knot in one end of each ribbon and thread it from the inside to the outside and back through the second rivet to the inside again. Tie another knot on the end of the ribbon and repeat for the second handle. Voila! Here is your finished gift bag! 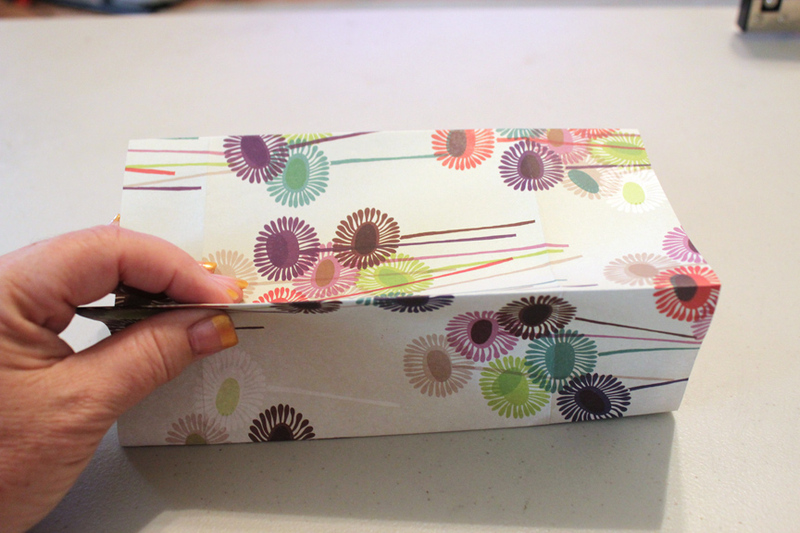 You could add a little scalloped tag or rectangle tag to the handle to customize for birthday, thank you or whatever occasion. This entry was posted on Friday, August 12th, 2011 at 3:15 pm and is filed under Uncategorized. You can follow any responses to this entry through the RSS 2.0 feed. You can leave a response, or trackback from your own site. 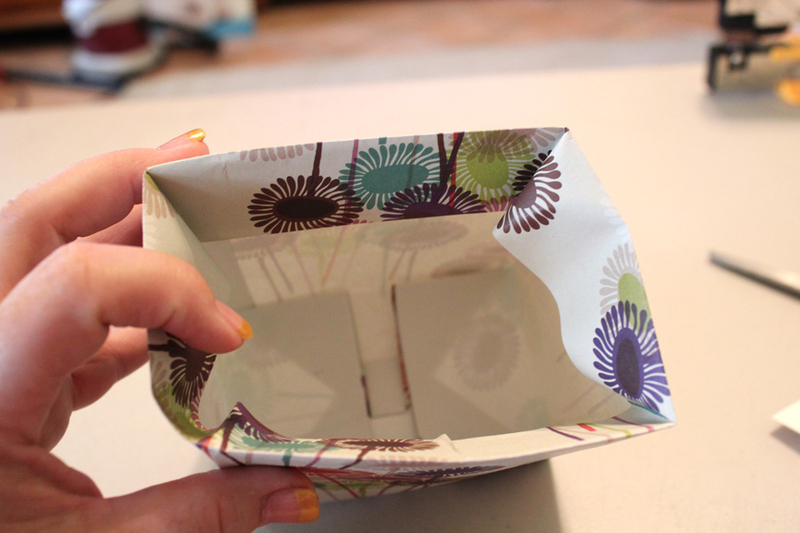 2 Responses to Day 224 – Mini Gift Bags You Can Make! Can’t wait to see what you are making! I have a couple things to post on CMF’s hopefully today! PS– Jealous you get to see Baby Jack all the time. Love ya!